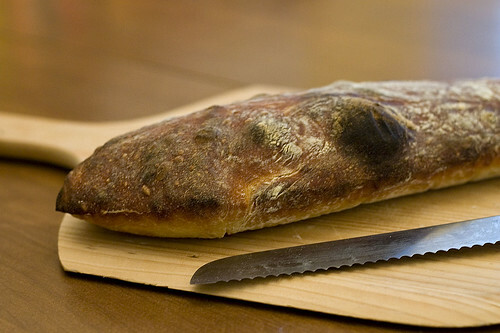 Angela has been hinting to me for several years that I needed to try to make semolina bread. It’s not that I was against making it, it was just that I never got around to it. Whenever I thought about it, I’d look at the recipe and realize that it required a starter and that I simply didn’t have the time to get it ready for dinner. So I kept putting it off. A combination of factors led to me actually making the semolina bread but the primary reason was that I had to go to the opposite side of the country for work the next week and I wanted to make something special for Angela before I left. Given that she was out all Saturday, meant that I could sit around and make the various sponges and doughs required without being dragged out of the apartment by a girl with wanderlust. 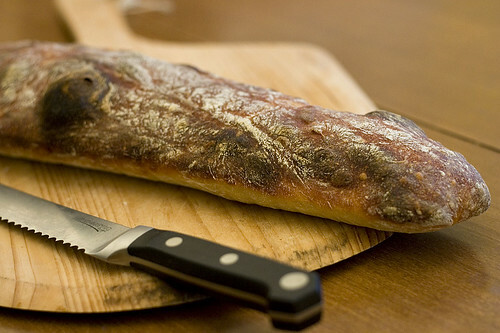 As a bit of an aside, I should mention that I make bread fairly frequently to have with dinner. I don’t do a particularly complicated bread but it tastes pretty good (and someday I may post the recipe on here). It doesn’t use a sponge or a starter. I let it rise two times if I have the time available. It’s never exactly the same any time but everyone who’s had it likes it. Making the semolina bread was quite different than what I usually make. The sponge was easy enough: just mix the yeast, water, and bread flour together and let it sit. For the actual dough, I make it in a food processor for the first time (I usually use a KitchenAid mixer but I recently got a Cuisinart food processor and thought I’d give it a try). The dough came together quite well in the food processor and didn’t give me any difficulty. I was surprised by how quickly the dough was ready, kneading included. It almost seems wrong for the kneading to only take 20 seconds. Of course, you can always switch to kneading by hand. The bread itself was good but I don’t think I could eat it every day. It was almost too flavorful. 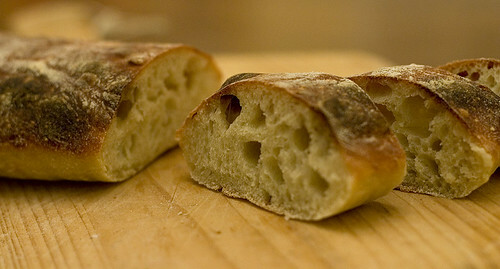 The semolina becomes one of the dominant flavors in the bread. I wonder if it might be better if it was made without a starter. To make the sponge, pour the water into a bowl and whisk in the yeast. When the yeast has dissolved, stir in the flour. Cover and place in a warm place until it doubles in volume, about 2 hours. In the bowl of a food processor fitted with the dough blade, put the sponge, 1/2 cup of the flour, the semolina flour, the salt, and the olive oil. Pulse until the dough forms a ball. If the dough does not form a ball, add more flour by the tablespoonful then pulse, until the dough does form a ball. After the dough has formed a ball, let the dough rest for 5 minutes then run the food processor for 20 seconds straight to knead the dough. Remove the dough from the food processor and place in a well oiled bowl. Cover the bowl and put it in a warm place until the dough doubles in volume, about 2 hours. Remove the dough from the bowl and place it on a floured work surface. 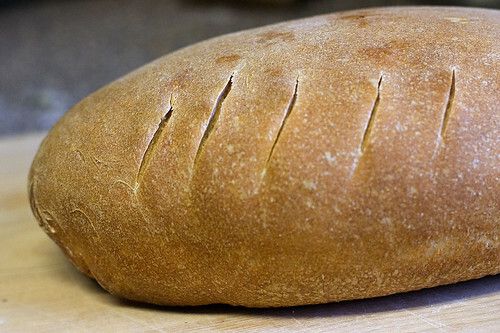 Pat the dough into an oval shape and then roll it gently to form a plump loaf. Transfer the loaf to parchment lined baking sheet and cover. Allow it to rest until it doubles in volume, about 2 hours. After the loaf has doubled in size, cut marks into the side of the loaf at a 30º diagonal to vertical, spaced at 1″ intervals. 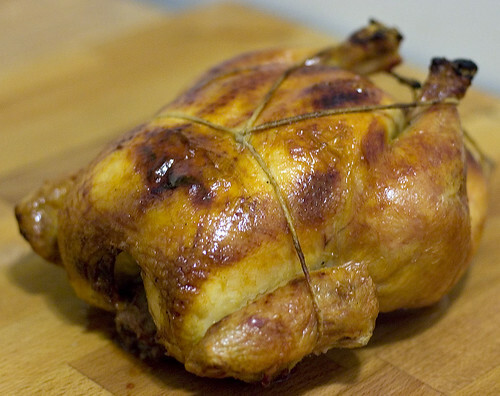 Bake for 35 to 40 minutes or until the bread is golden brown. When the Atkin’s diet became popular and low-carb was all the rage, flat bread began showing up everywhere. Any place there was a sandwich previously, there now was a wrap. They even showed up at my work’s cafeteria. Personally, I don’t subscribe to the low-carb mythos. In reality, I’m only on the eat-what-I-want diet (this one is a lot of fun, you should try it out). But, I do like flat bread where appropriate (how can you say no to tacos?). As soon as I saw this recipe, I knew that I had to make it. It was simple enough to be lunch but interesting enough to not be a throw away meal. And it was, on both counts. It’s a simple and fast recipe. But it’s also quite tasty. 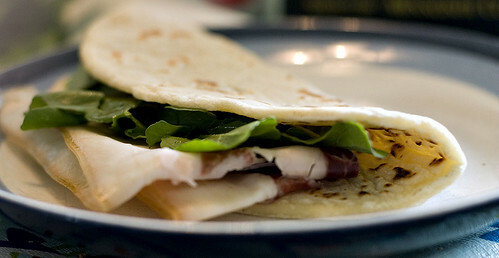 I dressed up mine with prosciutto, arugula, and olive oil. Angela went a bit less Italian and piled her’s with turkey, ham, and swiss cheese (and, for the curious, it really ended up being too much meat for her to eat). It also was good drizzled with honey later (credit goes to she-who-must-be-obeyed for discovering the combination). In a bowl, mix together the flour, salt, and baking powder. Make a well in the center of the flour and pour in the olive oil. Add most of the water and most of the milk. With a fork, slowly incorporate the flour into the liquid. Add the remaining water and milk to the bowl. Continuing mixing until it forms a dough. Add more water and milk if needed. Remove the dough from the bowl and knead on a floured surface until smooth, about 10 minutes. Divide the dough into 6 pieces. Heat a cast-iron skillet or griddle over high-heat. 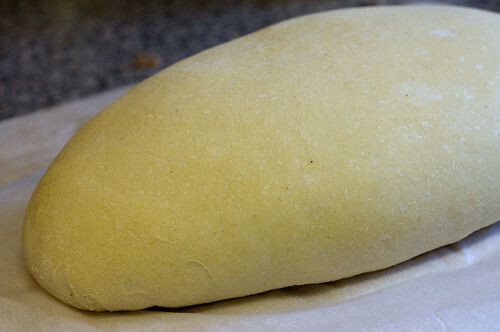 Roll out one pieces of dough until it’s 1/8″ thick. 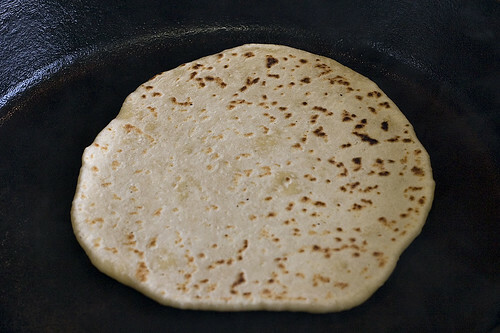 Place the dough in the skillet or griddle. Cook for 30 seconds on one side, turn it over and cook for 30 more seconds. Remove from the skillet and set-aside. Repeat with the remaining dough. Stuff with meat or cheese or vegetables and serve immediately.